Salt Lake City’s Sentou have delivered their first full-length album, Towelette. Sentou’s previous EP, Welcome To The Basement, came out in October of last year. With Towelette, Sentou deliver more sleepy, positive optimism like late-afternoon lemonade or an early-evening cocktail. 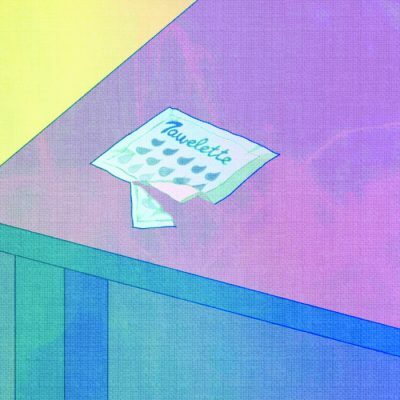 Towelette is lo-fi shoegaze sugar that plays out like a soft pillow or ice cream—blissful arrangements that stay to tone. When you commit to these easy grooves, you have to commit 100 percent. Sentou do just that. The album is bookended by two soft instrumentals, “Getting Clean” and “In The Kitchen,” which make it clear what centerpoint vibe the top spins on. The record is a fine, easy listen. On the song “Repeat,” Sentou give us common-sense philosophy under a delicious synth line with clean, simple percussion. “It’s another day / I’m the same way / It ought to be a sin / To do it all again.” This simple line sets up the refrain that gets repeated over and over: “Listen to the alarm / Wake up / Repeat.” Life is a chore, but in the end, “It can’t be that bad,” a female voice delivers pointedly out of the blue at the end of the track. The song “All Night” brings the seduction in the form of simple, sweet foreplay: “We can take a walk / Go around the block / Take it slow and talk,” all leading to lying in bed watching a movie. Sentou are equivalent to that glass-of-wine buzz as the sun fades—the record is the liquid sunset that tastes good at dusk.